Have you ever wondered why some new cars are driven so sparingly by their owners? Here's the story of an extreme example: a 1997 Land Rover Defender 90 with just fifty miles on the odometer. As you might imagine, I get a lot of e-mails from readers. Some of these messages are highly important, because they express grave concern for the serious issues facing our society today. "Dear Doug," one might read, for instance. "I wish it had been you driving that taxi instead of Jeff Gordon. And I wish you had killed Travis." I save these e-mails, because they come from loyal, dedicated fans of the site, who I am told will be apprehended any day now. I also get a lot of e-mails from people who want to promote things. "Dear Doug," these e-mails usually begin. "I've developed a new tire shine product that I would like you to try out. It's a secret formula that involves some baby lotion and some ground-up wombat teeth. I call it: WOMBABY!" I also save these e-mails for the day I'm called to testify in the inevitable poaching trial. But mostly, when I get e-mails from readers, I take the only appropriate course of action, which is to delete them immediately. This is because I have a Ferrari, and I do not typically enjoy communicating with peasants. But I received an e-mail last week that I just couldn't ignore. It came from Mark Karpinski, production manager at MotoeXotica, a high-end used car dealership near St. Louis. Mark wasn't trying to sell me animal parts, and he didn't include a death threat on a member of the Jalopnik staff, so my finger immediately went to the "delete" button. But then I read the words: 1997 Land Rover Defender 90 with 50 original miles. That's right, folks: 50 miles. Fifty miles. Five. Zero. Miles. Or, put another way, we're talking about a 17-year-old SUV that was driven – on average – approximately 2.9 miles per year. Or at least, so says the Carfax vehicle history report, which includes one of those "average miles driven per year" sections for people who aren't quite sure how to use a calculator. But the real story is actually more interesting than Carfax would make it appear. Now, before I get started, it's important to provide a little history on the Land Rover Defender. While it's been available in Britain since the dawn of time (ancient tablets suggest that Hadrian's Wall was constructed on a summer afternoon using only two slaves and a Series II pickup), the Defender was only sold in the US from 1993 to 1997, with the exception of 1996, likely because – let's be honest here – Land Rover forgot. 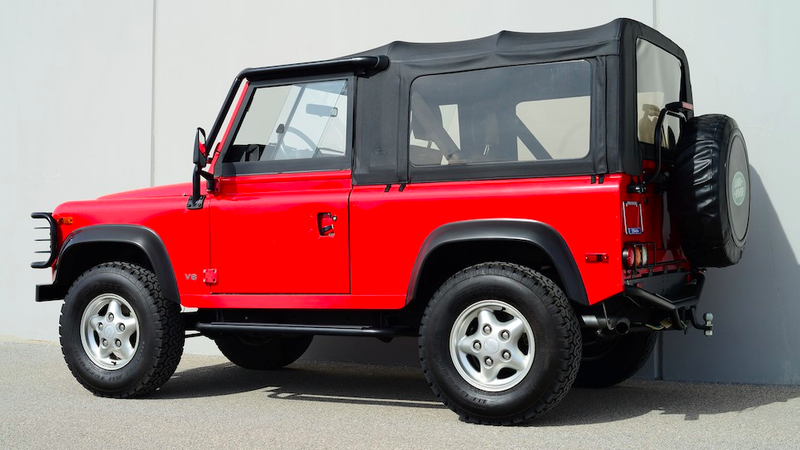 Originally priced in the $30,000 to $40,000 range from new, the Defender 90 quickly became a cult icon in the States, where buyers were split evenly between a) rich people from Greenwich, Connecticut, and b) rich people from the Hamptons. Speaking of peasants, I am told that some Defenders also went to Nantucket. As a result – and because Land Rover limited supply to less than 7,000 vehicles for the US – used values started to climb soon after the trucks were discontinued. And while it's now possible to import an older Defender straight from Europe, nothing commands the premium inherent to a true "North American Spec" Defender. A quick check on AutoTrader, for example, reveals that low-mileage 1997 models routinely top $60,000 and $70,000, with a few really low mileage trucks – 15,000 miles or so – in the $80,000-plus range. And that brings us back to the 50-mile example. According to Mark, this Defender 90 was purchased new in 1997 by an engineer-turned-doctor in the St. Louis area. Except it wasn't purchased the same way a normal car would be. There was no dealer prep, and no detail work in a service bay. The window sticker was never hung on the window. Instead, the owner took delivery immediately after the SUV came off the truck from the port. Then he drove it straight home and parked it in his garage. The next time it emerged was four months ago. Now, you might be wondering – as I did – why the hell anyone would buy a vehicle that's been purpose-built to carry wealthy tourists through the African jungle as they shoot at gazelles, and then leave it sitting in a Midwestern garage for nearly two decades. Mark isn't sure, but he thinks he knows the answer: the owner predicted that Defender values would eventually skyrocket, and he wanted to – one day – cash in. "He bought it as an investment," Mark told me. "Along with the other cars." That's right: our Defender owner had a fleet of interesting vehicles ranging from a Ferrari 308 to a Ford Model T, two MGs, and a 1957 Thunderbird. Nearly all of them were stored the exact same way: undriven for years. But the Defender is the only one with delivery miles. Unfortunately, the owner is now in failing health, and that mean the time has come to sell the cars. This includes the Defender, which has been preserved so originally that – according to Mark – you can still smell the cosmoline rust preventative they add at the factory. There are even faint chalk marks on the bumper from transport. It's a time capsule. Your next question might be: How the hell do you sell a car that hasn't been started since the Lewinsky scandal? According to Mark, that has an interesting answer as well. Back in November, the Defender was flat-bedded to Plaza Land Rover near St. Louis, who changed the fluids, removed and cleaned the fuel tank, and replaced some minor parts. They also took it for a test drive around the block, thereby adding eight miles to the odometer – or roughly two-and-a-half years of driving, on average. Unfortunately, Plaza threw away the Defender's original battery, which means that this truck is only ninety-nine point nine percent original. But don't be too disappointed, Defender purists: they left the original air in its original tires. Think of that sweet, 1997 air, untainted by pop culture trends like Pokemon, Who Wants to Be a Millionaire?, and the rise and fall of the flip phone. Oh, if only that air could talk. It would say: "GET ME THE HELL OUT OF THESE TIRES! I'M TALKING AIR!" And that brings us to price. To that end, Mark has no idea. I have no idea. Nobody has any idea, because nothing like this has ever come up for sale before. Will wealthy Nantucketers flock to this Defender as the ultimate example of a car they can no longer buy? Will they place ACK stickers on its unblemished soft top? Or will people stay far away, fearful of an undriven British car that still thinks John Major is the prime minister? It's hard to say. But years from now, when "Land Rover Defender" is the featured vehicle at the Pebble Beach Concours d'Elegance, the judges will fawn all over this one, awarding it perfect marks in every category: exterior, interior, engine, until… WHO CHANGED THIS BATTERY? !